Seeing your child smile is likely one of the best parts of your day -- as a family dentist with 4 kids of his own, Dr. Gonzalez knows that well. While you may not realize it, those precious pearly whites are more vulnerable to tooth decay than your own. Choosing our team as your children’s dentist in San Antonio can help you keep your little one’s smile healthy for the long haul. Keep reading to learn more about the importance of children’s dentistry and what you can expect from us here at San Pedro Smiles! Dental cavities, a.k.a. caries, are the most common disease affecting children in the United States. In fact, most kids will have had at least one cavity by the time they turn 12. But the thing is, tooth decay is 100% preventable with excellent oral hygiene habits and routine visits to a children’s dentist. During a six month checkup and cleaning, Dr. Gonzalez and team can check your child’s teeth for evidence of decay and other problems, and leave them sparkling clean to prevent future issues from developing. Indeed, staying on top of your child’s dental care will help their teeth stay healthy throughout childhood and in turn put them on the path to a lifetime of routine dentistry and a long-lasting smile. Your child’s first dental appointment should occur around the time they turn one. This visit is a good idea because it familiarizes your little one with the office and gives us a chance to make sure everything is developing just fine with their first few teeth. After an initial appointment, we may recommend you come back when they turn 3 to begin routine checkups and cleanings every 6 months. At each appointment, we will count your child’s teeth and take periodic X-rays to check for issues that could be lurking beneath the visible surface -- like tooth decay developing between teeth. Our dental hygiene team will also thoroughly clean the plaque and tartar from the surface of the teeth and around the gums, discussing the importance of excellent dental care in kid-friendly language all the while. As your child gets older, we may recommend additional preventive measures to keep their smile protected against tooth decay and gum disease. Dental sealants are thin, plastic coverings that shield the enamel against the acids and bacteria that cause cavities. Topical fluoride strengthens the tooth enamel to provide a better defense against tooth decay. 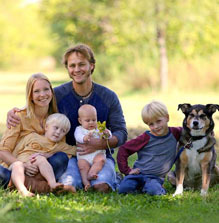 In addition to visiting the dentist routinely, try developing these smile habits at home, too. 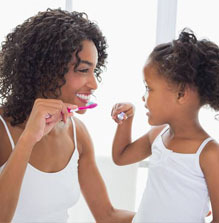 Remind your child to brush for two minutes, twice a day, and floss once daily. Sing the ABCs or set a timer to ensure they reach the two-minute mark each time. Keep a progress chart as a visual track record of positive brushing and flossing habits. Set small rewards for good brushing and flossing! If you know of more tips that have worked in your home, don’t hesitate to share them with us when you come in! Is your child’s smile developing on track? Visiting a caring children’s dentist can help to make sure the answer is yes. We invite you to contact San Pedro Smiles to schedule an appointment with your family dentist in San Antonio today!